The Little House of Concrete Bookshelves: Andrea Camilleri "The Dance of the Seagull"
In a note attached to the source that provided the recipe for Hughesy’s favourite slow-cooked Bolognese sauce someone commented along the lines of it doesn’t matter how old and doddering you get, if you can still put out a really good sugo (or, I guess an excellent ragu) people will continue to beat a path to your door. Salvo Montalbano’s hit 57, his creator has around thirty years on his creation, and The Dance of the Seagull delivers another hearty serve of character study disguised as crime novel. Actually, I could come up with any number of food related observations when discussing a Montalbano novel, starting with the observation that I preordered this title through iTunes, had it downloaded immediately after publication and demolished it in a couple of sittings in much the same way as Montalbano demolishes a platter of the usual mullets. Montalbano novels, much like the protagonist’s gastronomic accomplishments, tend to be hearty fare based around familiar ingredients and flavour profiles. Montalbano might be equal parts hearty eater and gourmet but he isn’t (at least as far as Hughesy can make out) the sort of diner who’s going to spend time lingering over subtle flavours and nuances. He’ll spend his share of time pondering preoccupations with the physical changes that start to kick in as you move through your late fifties, and his internal monologue will rail against incompetence and corruption in Sicilian politics and the Italian bureaucracy while events around him follow a familiar (to long term fans and readers) pattern. This time around his early morning insomnia has him staring at the ceiling around five-thirty, bitterly recalling his younger days when he was able to sleep through. Opening the doors to his beachside home the morning he’s due to head to Palermo to pick up Livia, his long-time main squeeze, he watches a seagull land on the beach, perform a peculiar dance, turning in circles with beak pointed to the sky before collapsing, dead. Placing it in a bin bag, Montalbano swims out to give it a respectful burial at sea and heads off to collect Livia, who has never seen some of the more picturesque parts of the island. Montalbano might need a break, but he doesn’t need one in the Val del Noto, because he wouldn’t want to run into a film crew shooting an episode of that television series just as we’re walking around there . . . They film them around there...Predictably, the last thing he needs is to find himself face to face with the actor who plays me, a phobia (or, in Livia’s words a childish complex) he should be well and truly over, not least because he doesn’t look the least bit like you. Before he can head off there are papers that need to be signed, which means a brief stop at the office, where a request to send Fazio to him produces the news that he hasn’t come in and seems to have gone missing, having apparently gone out alone on an investigation Montalbano knows nothing about. According to his wife Fazio was meeting Montalbano at the docks the previous night and failed to return home, so the harbour’s an obvious place to start looking, and the vacation is, for all practical purposes, off. 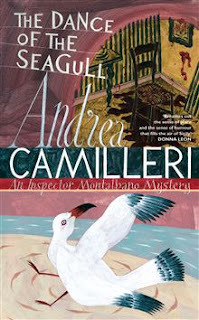 Arriving at the docks, Montalbano hears reports of shots fired in the dead of night. Acting on information received they search a chiarchiaro, effectively a Mafia cemetery in a landscape of sinkholes and dry wells, the legacy of a cancelled highway project that took green and arable land and made a desert of it. There’s no immediate sign of Fazio, but two bodies are found before they track down Fazio in the same area, badly wounded having walked into an ambush with little memory of the finer details of the sequence of events that landed him there. There’s obviously something dodgy going on at the waterfront, and it’s up to Montalbano to ensure that Fazio stays safe while his memory returns, figure out the identities of the bodies they’d found and get to the bottom of whatever it is that someone wants kept quiet. Those things were never going to be easy, but there are a couple of issues that make them more difficult than they should be. For a start, with Fazio out of the investigative picture, Mimi Augello is distracted by an ongoing argument with his wife, Beba, the hospital is a fair drive from Vigata and he needs to make the journey there and back twice a day to fit in with visiting hours supervised by the nurse Salvo labels the Sing-Sing prison guard and when he gets there he’s easily confused by the hospital’s labyrinthine corridors and passageways. Fortunately, there’s Angela, a helpful and very attractive nurse on hand to guide him to the requisite destination, though her apparent availability and willingness to participate in a bit of horizontal mambo comes across as definitely dodgy and, of course, along the way there are the regulation and requisite interactions with Catarella on the station swishboard, Commissioner Bonetti-Alderighi and his doorman, Deputy Commissioner Lattes (Caffè-Lattes behind his back) who continues to inquire politely regarding the health of Montalbano’s non-existent wife and children. Fazio’s injury is the sort of thing the c'mishner is going to want to be kept up to speed with, and this time around the excuse that keeps Montalbano from attending requested interviews involves an impending visit by a Swiss specialist named Gruntz, who’ll be performing a rectal procedure called the double Scrockson. Given the excuse, Montalbano can’t be seen eating at Enzo’s trattoria when the Commissioner is eating there, so he’s forced to hole up in a back room, which has absolutely no effect on the Montalbano appetite. The answer to the big, Fazio-related question turns out to involve a Mafioso with a big secret, the Russians, Arab terrorists and a prominent figure in the national government, a fact that would have the big boys from out of town stepping in if Montalbano can’t keep his cards close to his chest, which he (predictably) manages to do, using the usual mixture of intuition, inspiration and attention to seemingly insignificant detail. And having done so, settles down to enjoy a substantial plate of caponata.